Time for another guest design spot here on the Cropstop blog. Today's guest is none other than Gail Scott of I Like Paper. Gail is one of our most faithful followers and participants, I can always count on the her to get things started each month! I think Gail was trying to give us a break from the summer heat when she created her lovely Christmas card with it's beautiful Petaloo flower! I started my project with a cut of Kraft Cardstock for my base. I ran the Kraft through my Cuttlebug Die Cutting & Embossing Machine using Tattered Edge Darcie Embossing Folder. Next, Tim Holtz Gathered Twigs Distress ink was sponge around the embossing using a Dauber. I won a set of Couture Creations Ornamental Lace Die so I selected the largest one and white cardstock. I ran them through the Cuttlebug Die Cutting Machine to create a base for the Petaloo Poinsettia [there are other flowers available at Crop Stop - I am thinking this one is out right now]. Scotch Quick Dry White glue was used to glue the Poinsettia to the Lace Die Cut. 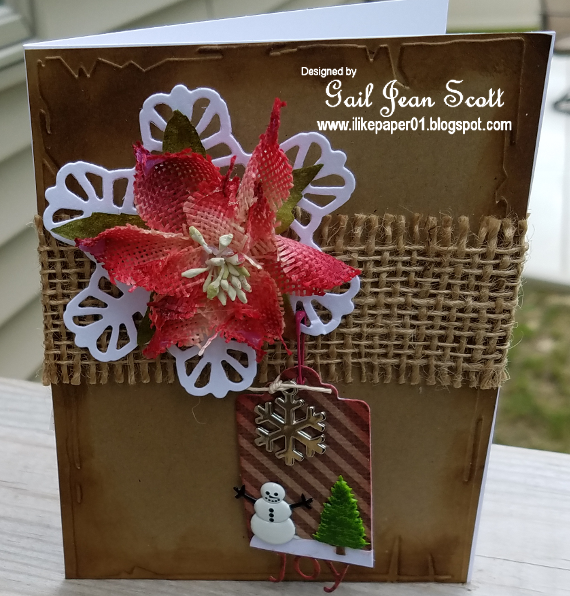 I used my ATG to place the burlap on the card base and then used Scotch Quick Dry Glue to adhere the Petaloo Flower and Couture die assembly. I found some cool Kraft Striped cardstock in my stash and used that to run the Poppy Stamps Joy Tag through my Cuttlebug. Next I used my Dauber to add Tim Holtz Fire Brick Distress Ink around the edge of tag and on the Word Joy. I attached the Tag with a tiny red safety pin. 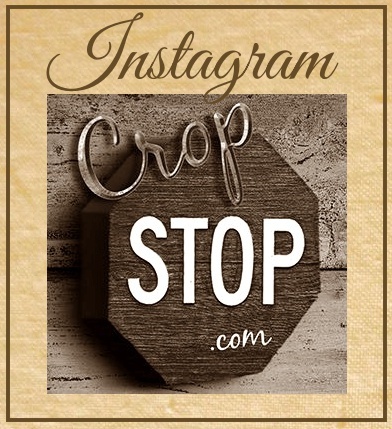 A metal charm was attached to the tag using Hemp Cord. I fussy cut a piece of white cardstock for the snow then added two Brads - A snowman and a Tree to the tag. My ATG was used to attach the finished base to White Cardstock." Have you been working on Christmas cards yet? No matter - we'd love to see whatever you've been creating! Stop by our current link party and showoff any project that includes a product or two from companies carried in the Cropstop store. 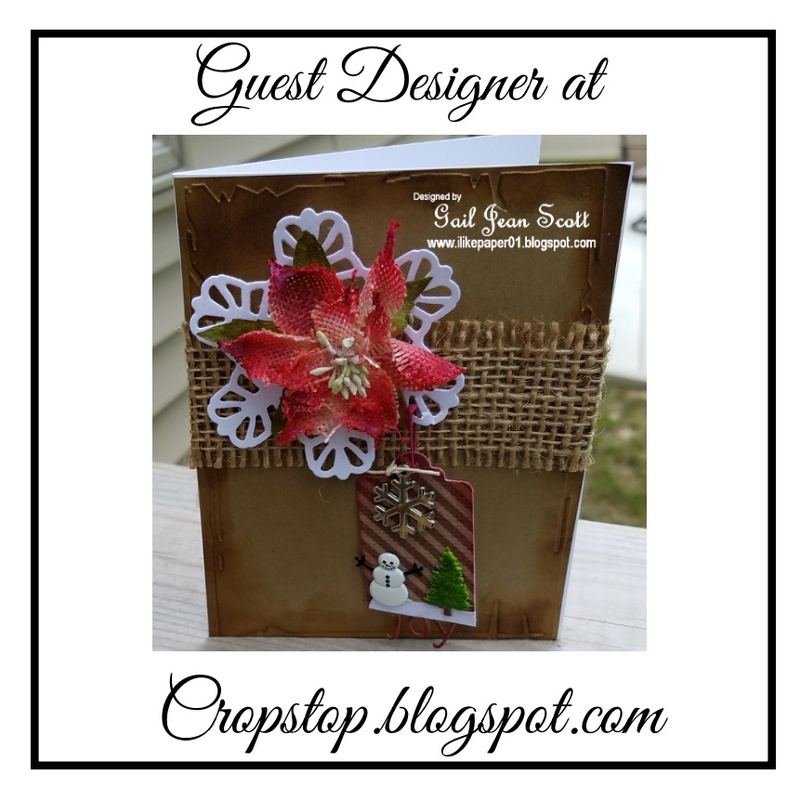 Congrats to Gail Scott on her Guest Designer feature! Beautiful card! Oh Gail, this is just darling!! Beautifully done, love the flower, texture and sweet tag!